Our first full week along the Texas Gulf Coast whizzed by. Even though our weather was a mixed bag of cold, warm, sunny, gloomy, wet and dry, I have no complaints. It’s been a great week exploring some familiar turf. This is our third January hanging out in Rockport, Texas, just down the road from Goose Island State Park. We’re staying in a private RV park surrounded by some familiar faces and some new faces. Although the RV park is much the same, there’s a few subtle improvements which are always appreciated. There’s also a few changes in the neighborhood, a couple of blocks away from the park. The first thing I noticed were the lack of sandhill and whooping cranes hanging around the neighborhood. Turns out, one of the homes in the area changed ownership, and the new owners decided not to keep up with a feeder. 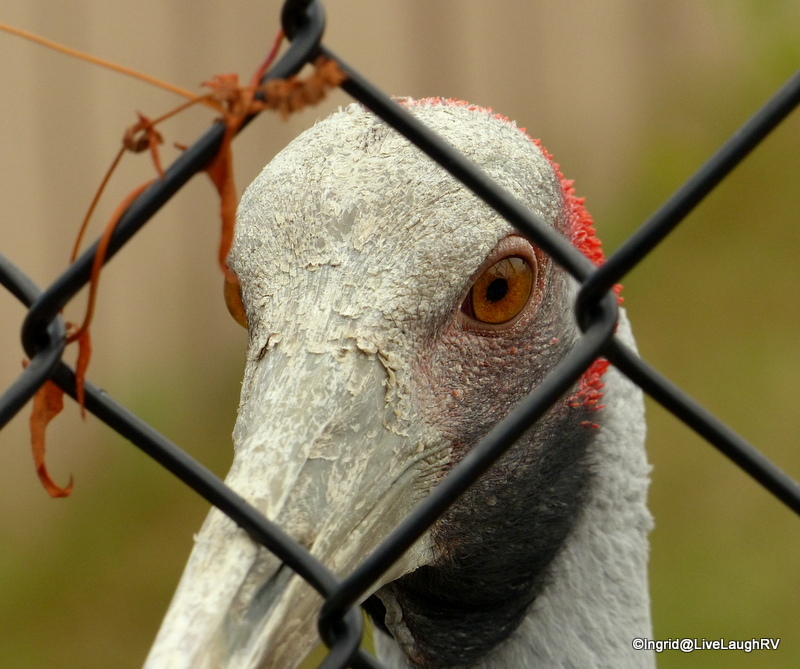 The locals aren’t too happy anyway about all the tourists and photographers parking in the middle of the road to capture glimpses of the rare, endangered whooping crane. 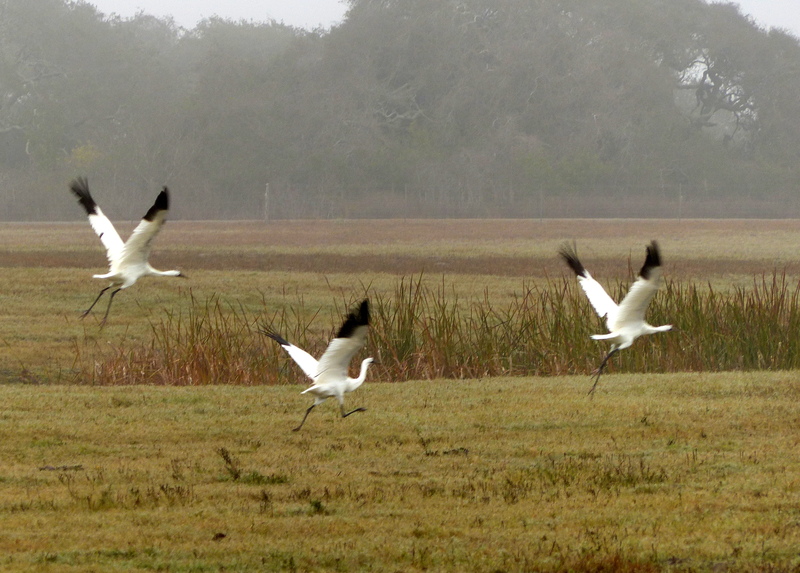 Plus, Texas has received an abundance of rain resulting in a bumper crop of Blue Crab, the whoopers favorite. I’m not sure what it is about these coastal birds that has me intrigued, fascinated, and totally enthralled. It’s captivating to watch these magnificent birds take flight or land. They exude a sense of weightlessness and perhaps even power that is mesmerizing. 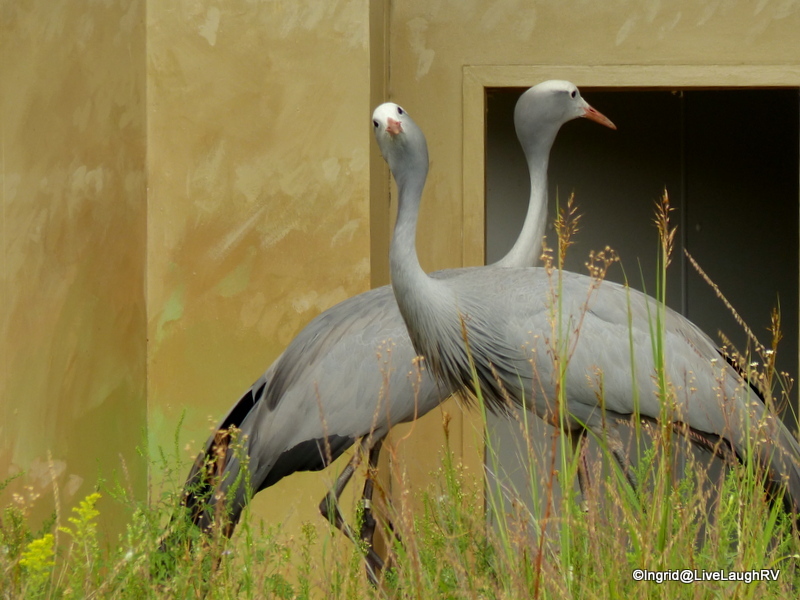 Yep, I’ve definitely developed a passion for cranes. 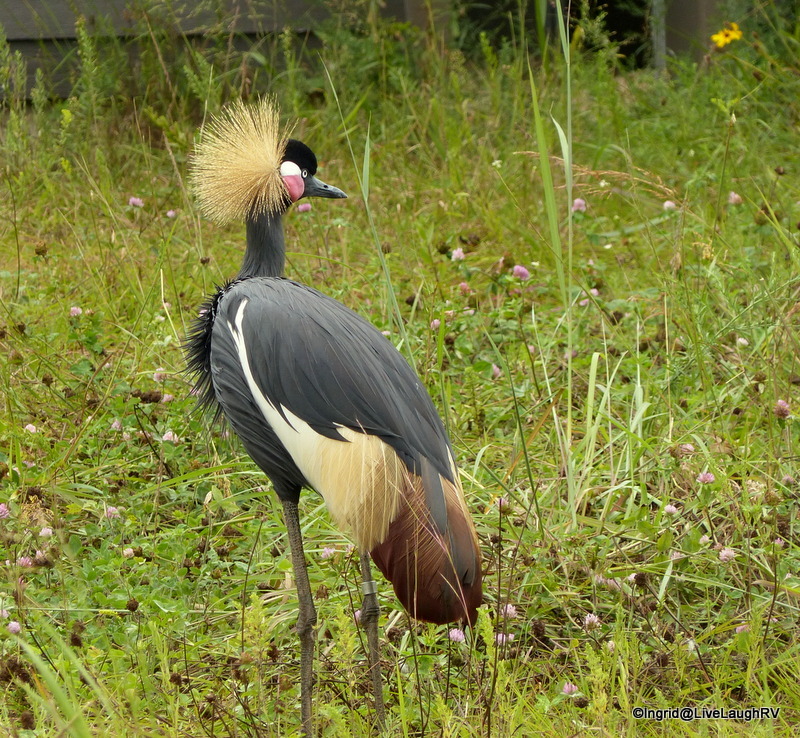 I’m a little disappointed I won’t be able to photograph these gorgeous birds this visit as easily as I did last year. 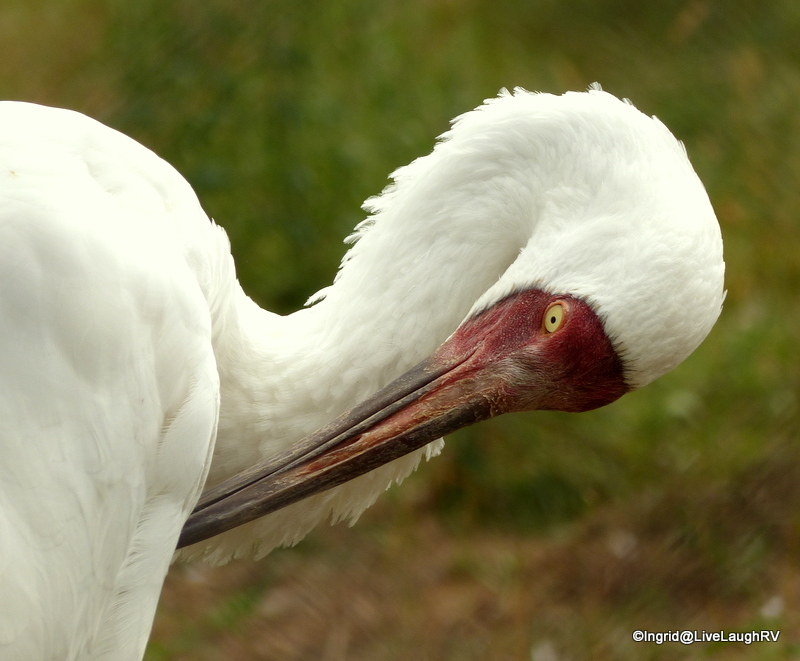 I might make a special trip out to the Aransas National Wildlife Refuge or I’ll focus on photographing some of the other beautiful coastal birds. 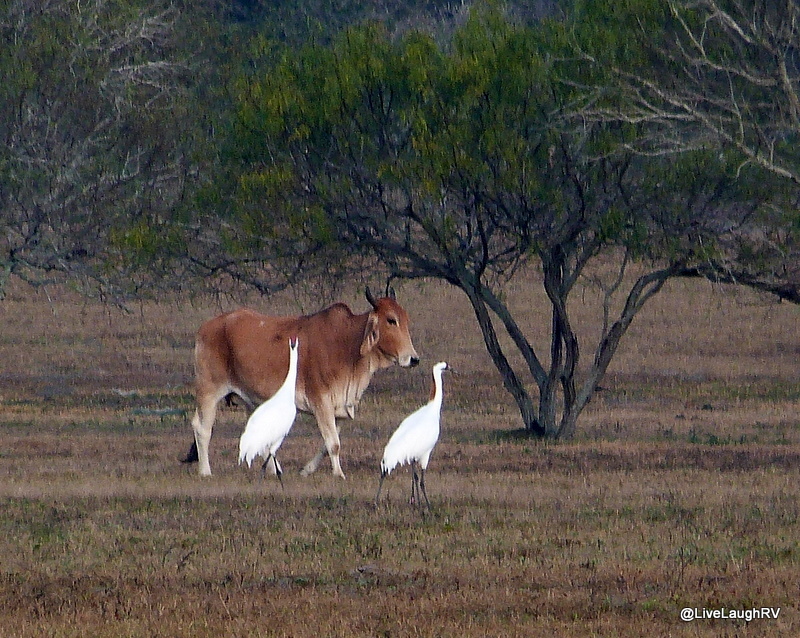 There’s no shortage of birds along the Texas Gulf Coast and a little patience and perseverance usually pays off. Who can pass up an opportunity to capture the pink beauty of a Roseate Spoonbill? Week one was off to a fabulous start, and thus I can’t wait to see what I’ll discover over the next three weeks. Fingers crossed the weather will cooperate. 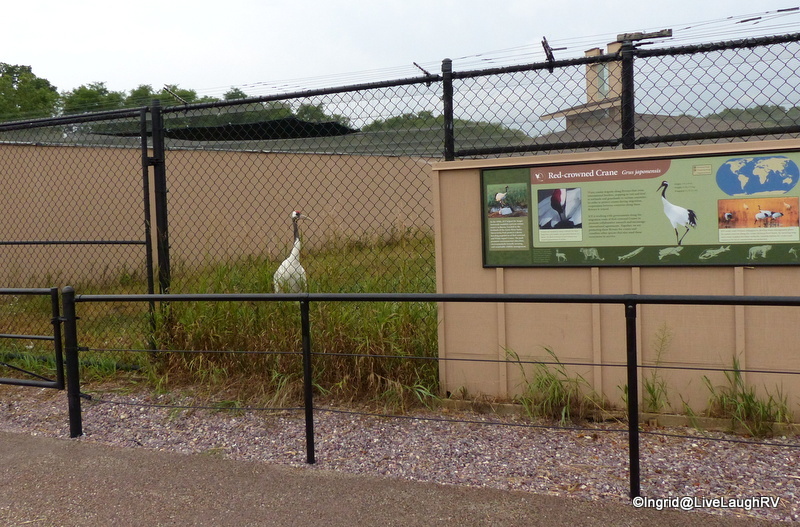 If you’d like more information on the endangered whooping crane, you can read my post here (I give some statistics) and here (my second trip) and here (my visit to the International Crane Foundation). We hit the road three days after Christmas…. two days later than we originally planned. Bad weather in southern New Mexico and western Texas necessitated an adjustment to our schedule, considering parts of Interstate 10 were temporarily closed due to ice and snow. While hubby and I kept an eye on news reports pertaining to the latest happenings including airport closures and flight cancellations, we agreed we sure don’t miss those years of air travel. The flexibility associated with RV travel has really spoiled us and we can’t imagine traveling any other way. Well, yes we can imagine it, we just don’t ever want to do it again. That said, our drive from Phoenix, Arizona to Rockport, Texas went well with the exception of having to deal with unwelcome cold weather. We spent the first night in Deming, New Mexico, at the Dream Catcher RV Park (an Escapees park), and although we had a full hook-up site, we kept the water hose and sewer pipe stowed choosing to hook up to electric only due to the below freezing temps. Night two was spent at a regular stopping point for us; the Hilltop RV Park in Fort Stockton, Texas. We thought about overnighting at the Walmart but once again with the extreme cold, we opted for hook-ups. I will say it was interesting as we passed the Walmart the next morning, the parking lot looked like an RV Park. I don’t ever recall seeing so many RV’s overnighting at a Walmart. Turns out, not only was the Hilltop RV Park full that night, but so was the Walmart. 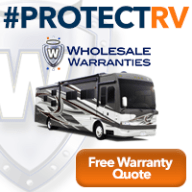 I think the inclement weather affected a lot of people and their travels causing Fort Stockton to be overflowing with RV’s. Moving on – We planned on spending night three in San Antonio at the Elks Lodge. I was looking forward to revisiting the Shops at La Cantera , located within walking distance from the lodge. From an architectural and aesthetic point of view, this outdoor mall is absolutely beautiful and it was my hope to see it decorated for the holidays with lots of Christmas glow. However, as we approached the Elks Lodge we encountered a sea of RV’s. I’m not sure how they all managed to squeeze into such a small parcel of land, but every nook and cranny seemed to be wedged with various RV’s. An RV chili cook off festival at the lodge had us moving on down the road in search of plan B. A holiday visit to the Shops at La Cantera will need to be saved for another time. About an hour south of San Antonio off Interstate 37 is the Choke Canyon State Park. 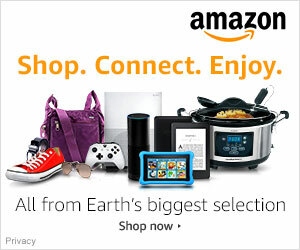 We scored a great site – #133. 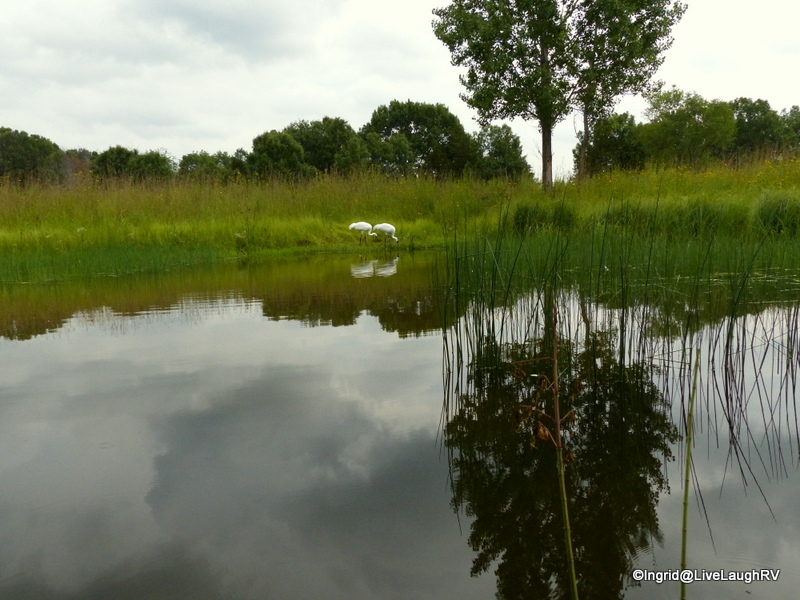 We enjoyed the campground and would definitely stay here again. On day four with twelve hundred miles behind us, we arrived at our destination just before noon. 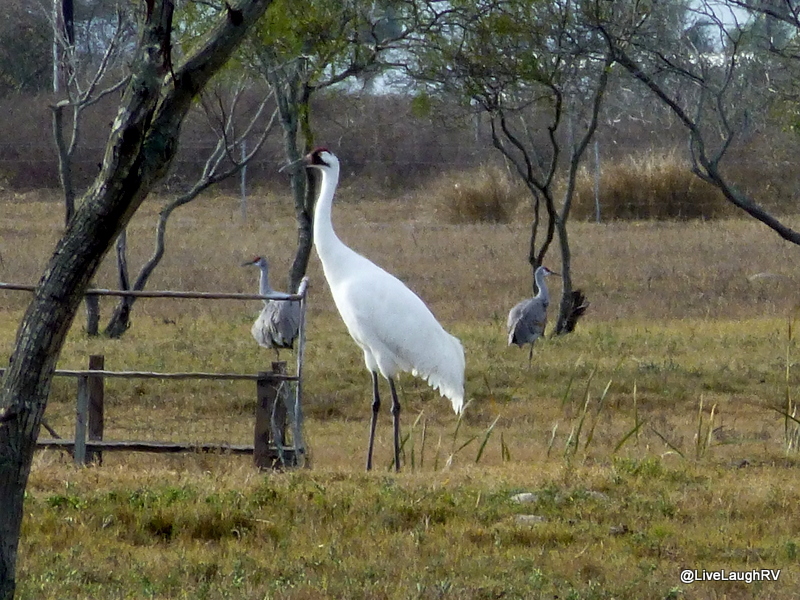 While I helped hubby position the RV into our new spot for the month of January, I’m greeted by a familiar sound in the distance; the sound of whooping cranes. As Al steps out of the truck to assess his handy work, I assault him with a child like exuberance that has him rolling his eyes. This has obviously turned into an unexpected passion for me, and I can see myself returning to this area time and again. 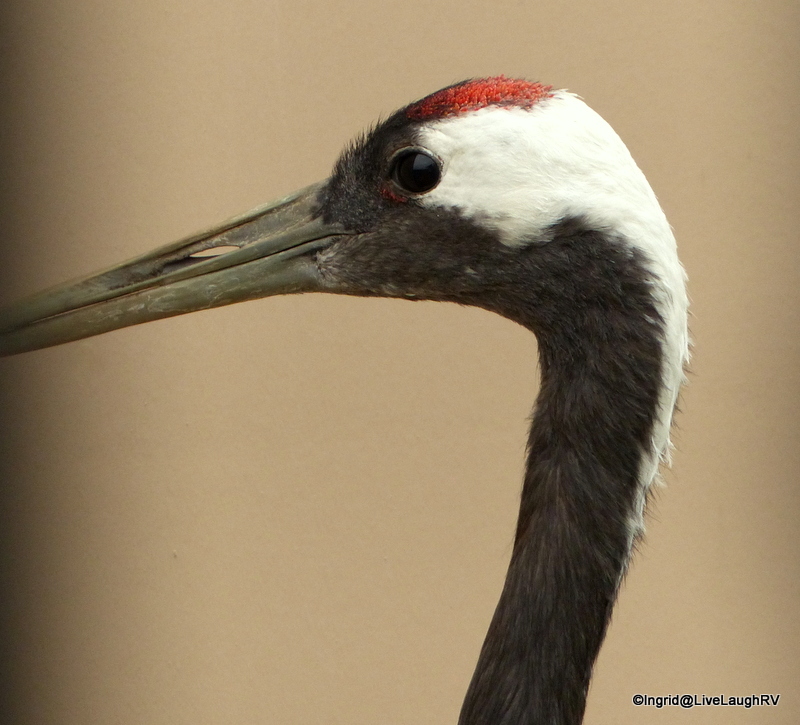 You can click here to read more about how my passion for cranes developed. 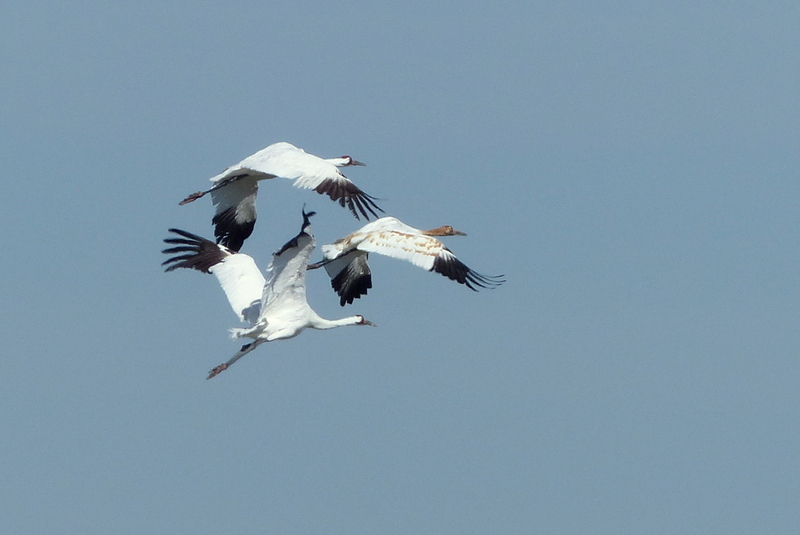 Last winter, it was quite exhilarating to have these two whooping cranes fly right over me. 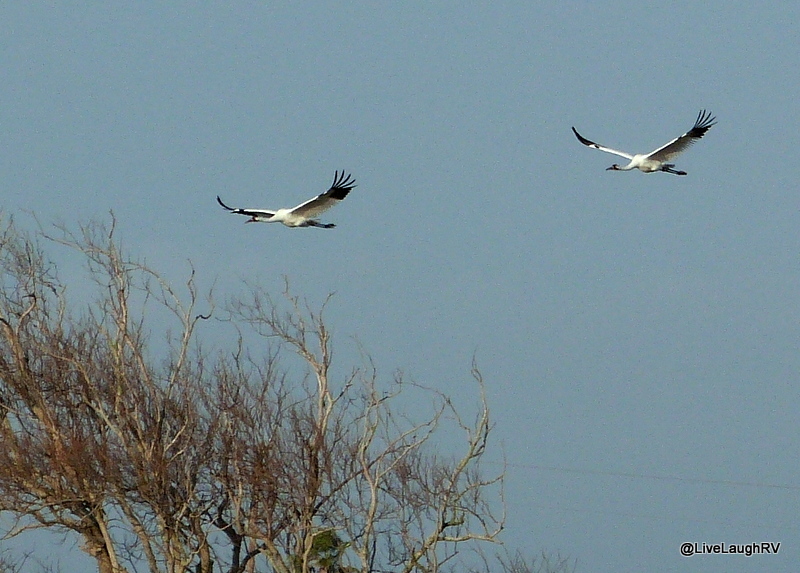 I could literally hear the rush of wind as they flapped their wings. 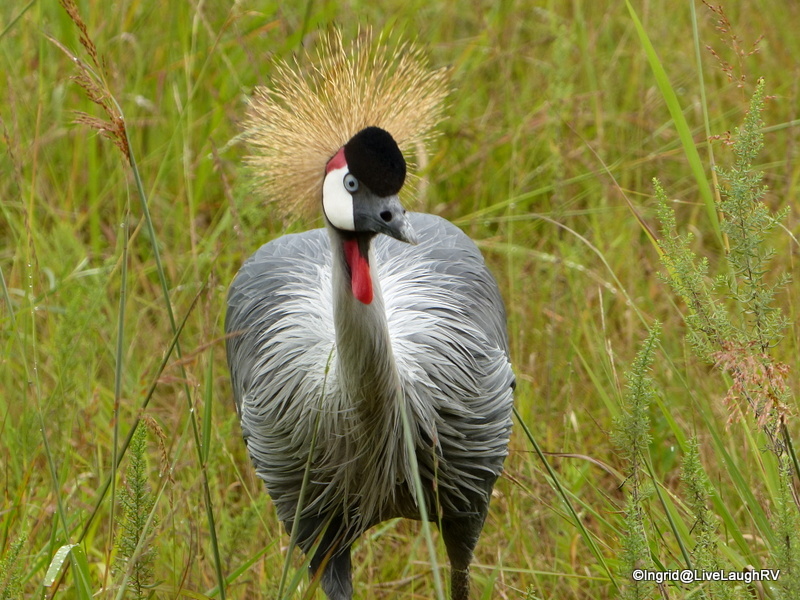 A rare treat considering there’s less than 500 of these magnificent birds left in the world. Photo taken at 160mm zoom. Although the weather this first week in January is expected to have less than stellar conditions for gallivanting about with the camera, I’m still excited to be back along the Texas Gulf Coast. 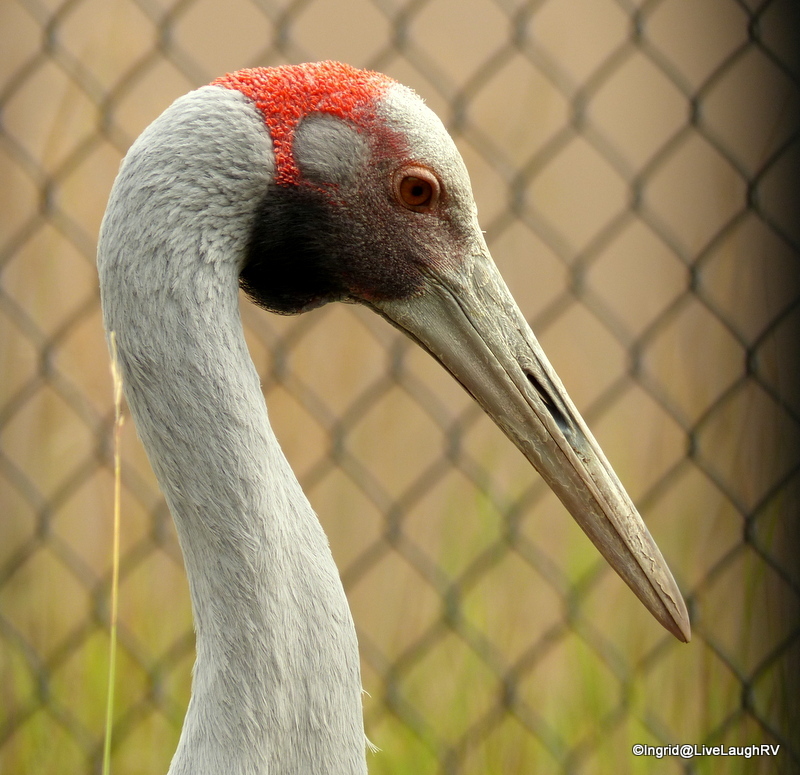 Cranes are considered to be a symbol of luck. I’m hoping by starting off the New Year hanging around these intriguing creatures of luck, that 2016 is a great year. 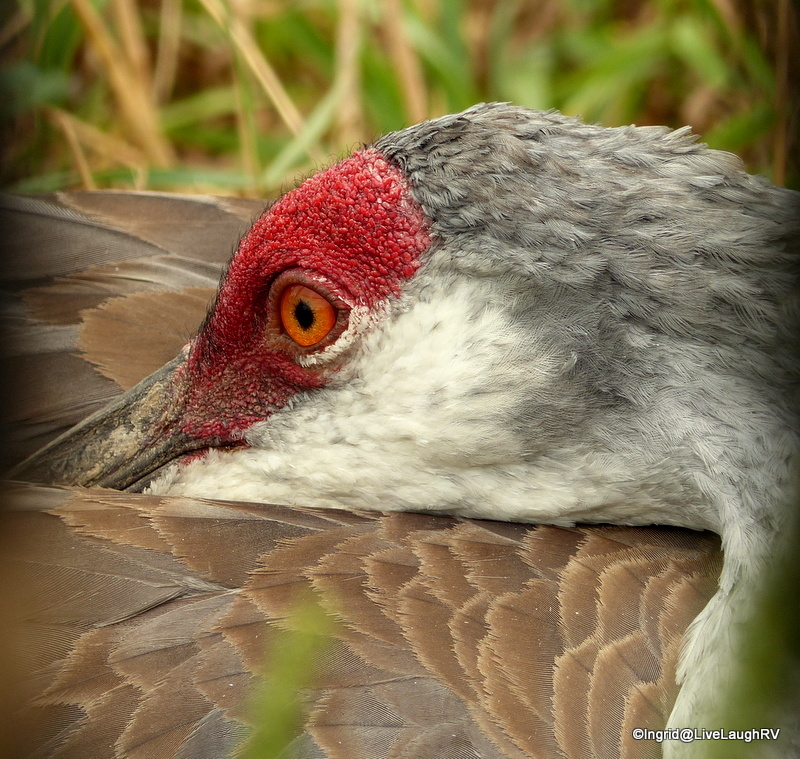 One of my most memorable places in 2015 was camped amongst 20,000 plus sandhill cranes. You can read about that visit here. Wishing you all a very Happy New Year filled with lots of good wishes AND good luck! I’ve been a little under the weather as of late and thus a tad on the quiet side. 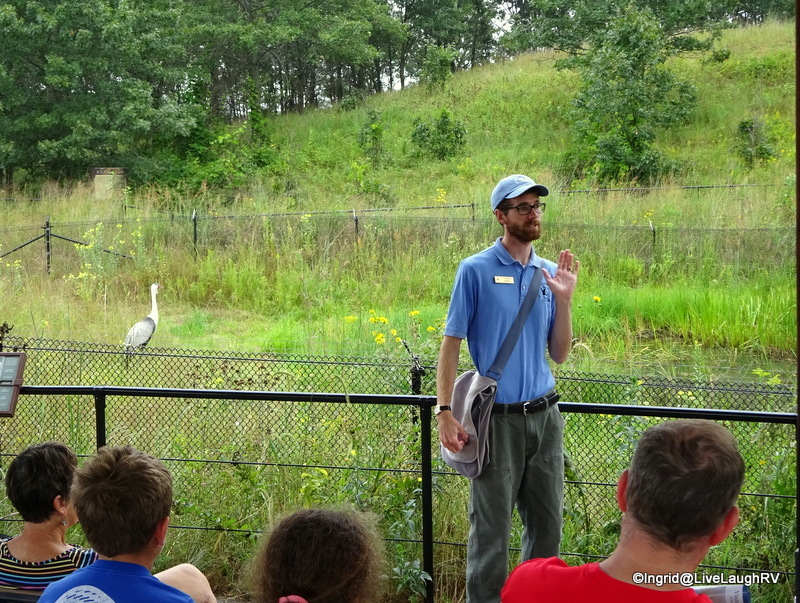 That said, few words are necessary when it comes to the Whooping Crane. 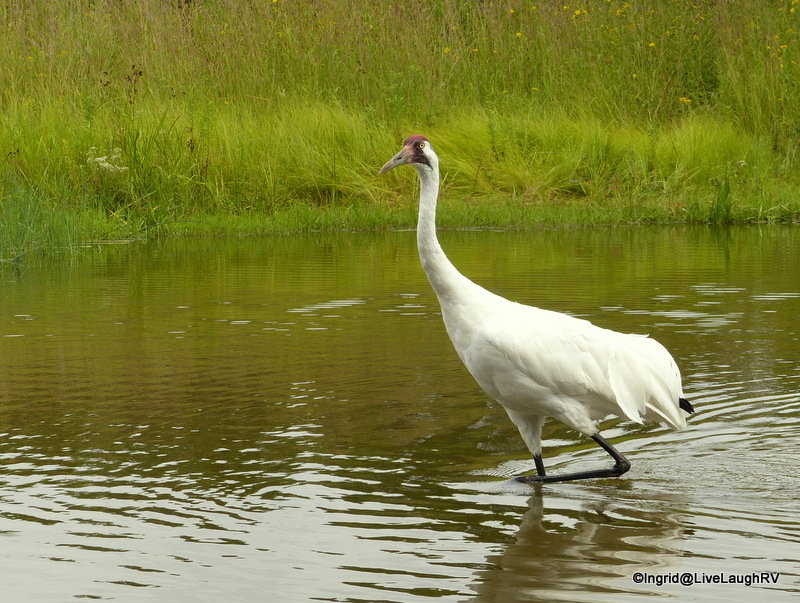 Allow me to share the majestic beauty of the endangered Whooping Crane. Watching these guys always leaves me speechless. Beautiful family of three. Mother, Father, child. With less than 500 left in the world, I feel privileged to be able to see these magnificent creatures every day as they winter just a couple of blocks away from our RV Park. It’s also not uncommon for me to hear their loud, distinctive calls while sitting in my RV. I can’t see them from the RV, but I sure can hear them. During one of my morning strolls, a foggy morning I might add, I managed to witness a heated exchange. 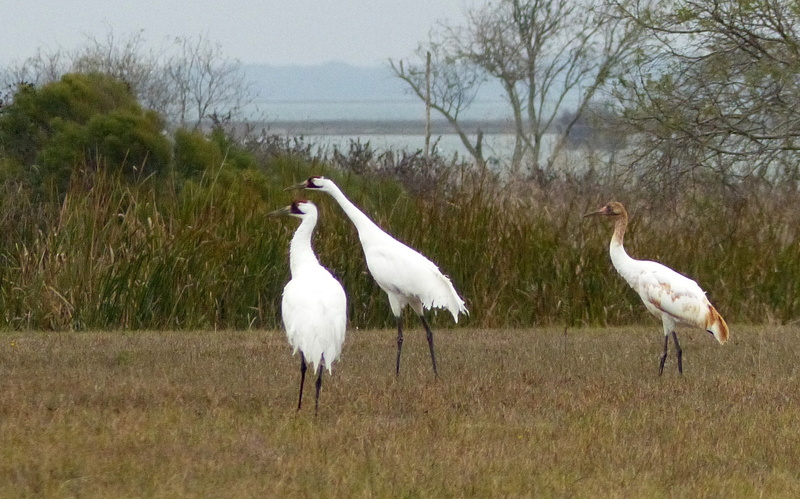 the 3 teenage whooping cranes eyeing the young juvenile. The exchange took place because dad did not like the way the three teenagers were looking at his daughter (I don’t know if the juvenile is a girl, but it sure did look like an over protective dad protecting a daughter). As the three teenagers (yes, they are teenagers at 2 years of age) started walking toward the family, dad was quick to let them know it was time for them to move on. The loud whooping calls continued amongst the group until the dad had finally had enough and ran toward the three teenagers. This type of encounter is common as families are territorial and don’t like to mingle with others when they have a child. Their priority is protecting their young one. 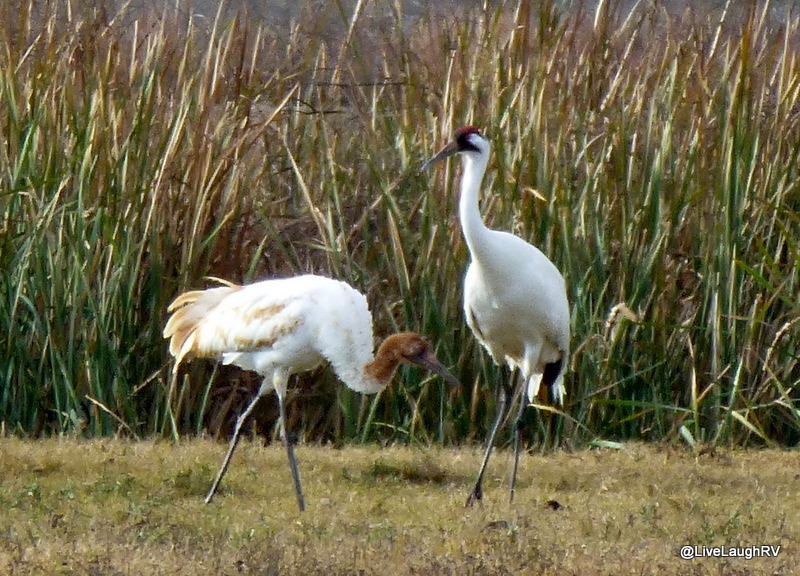 The three teenage whooping cranes are still too young to partner up thus these three whooping cranes can be found hanging together all the time and sometimes they hang out with the Sandhill Cranes. Once they do find partners, they mate for life. Even though the 3 whoopers have lost all the rust coloring of juvenile status, they don’t come into mating age until they are about 3 years of age. 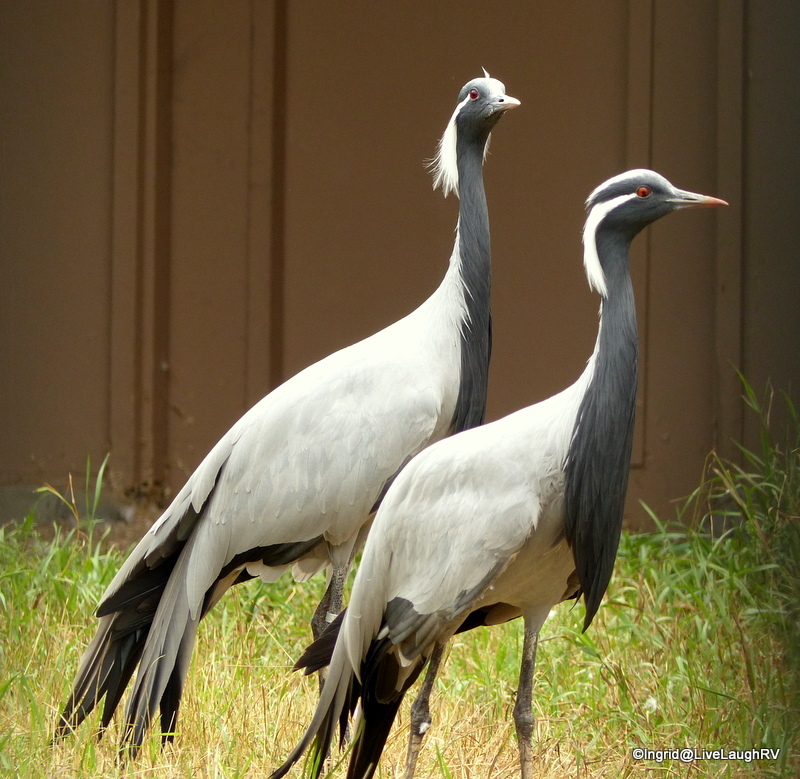 I’m still awed by these magnificent birds. They stand 5 feet tall (1.5 meters) and have a wingspan of 7.5 feet (2.3 meters). They can live to be 22 – 24 years old in the wild. 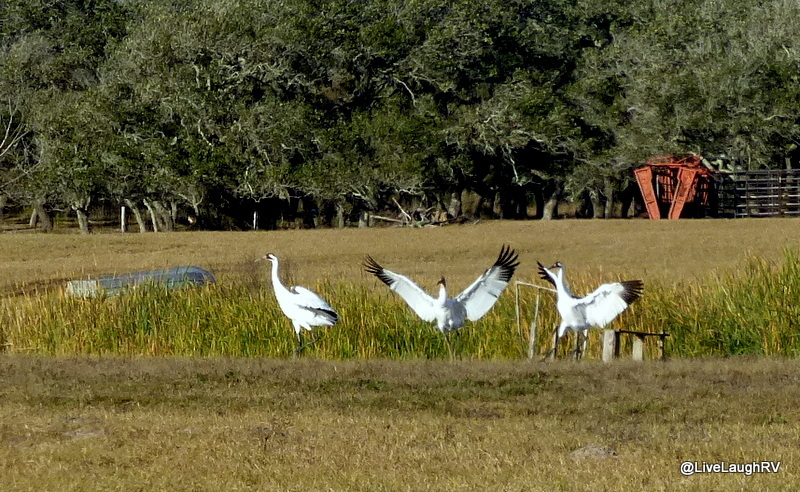 All the whoopers I’ve photographed here are wild whooping cranes and not one is banded. 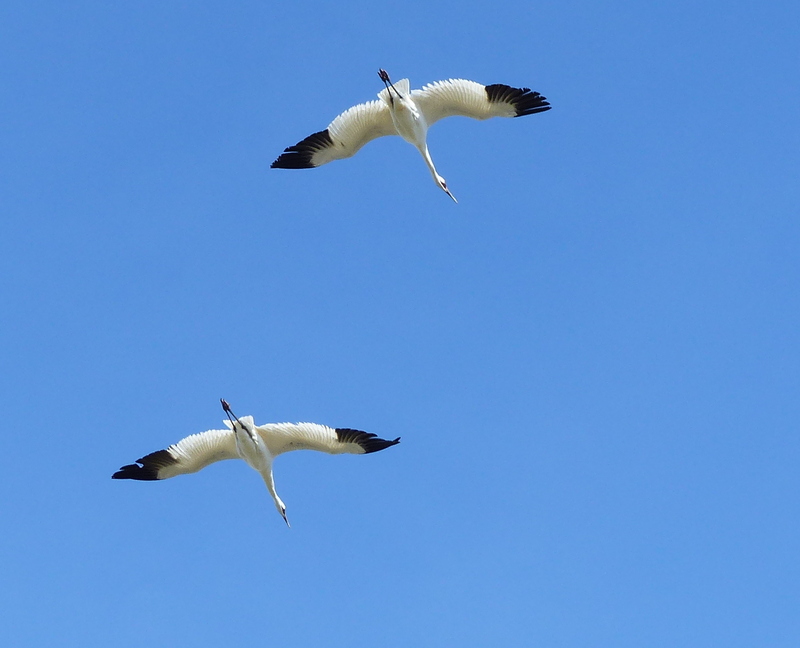 My most memorable moment thus far was the day they flew right over me. I can’t believe I managed to hold my camera steady as I looked up in awe…. such a rare experience. 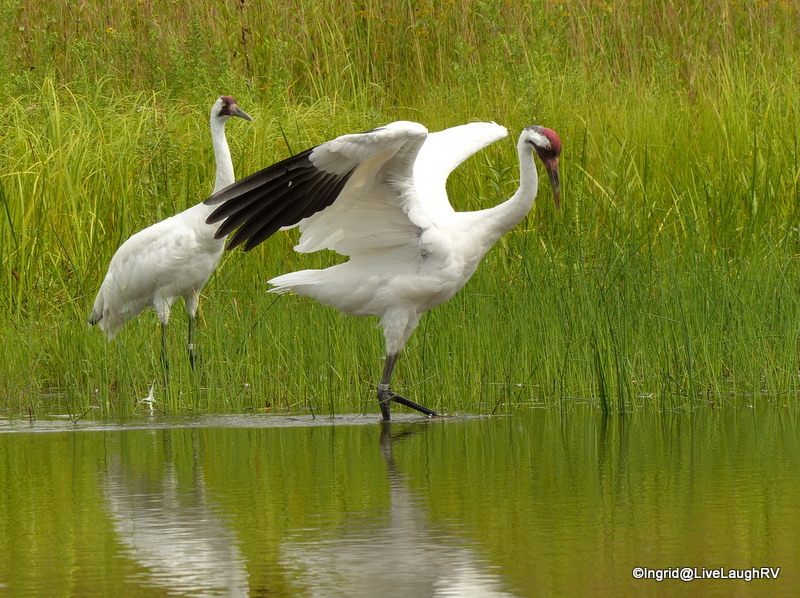 Did you know this group of whooping cranes spend their winter here along the Texas Gulf Coast and their summers at the Wood Buffalo National Park in far northern Alberta, Canada? That’s a 2,400 mile journey. 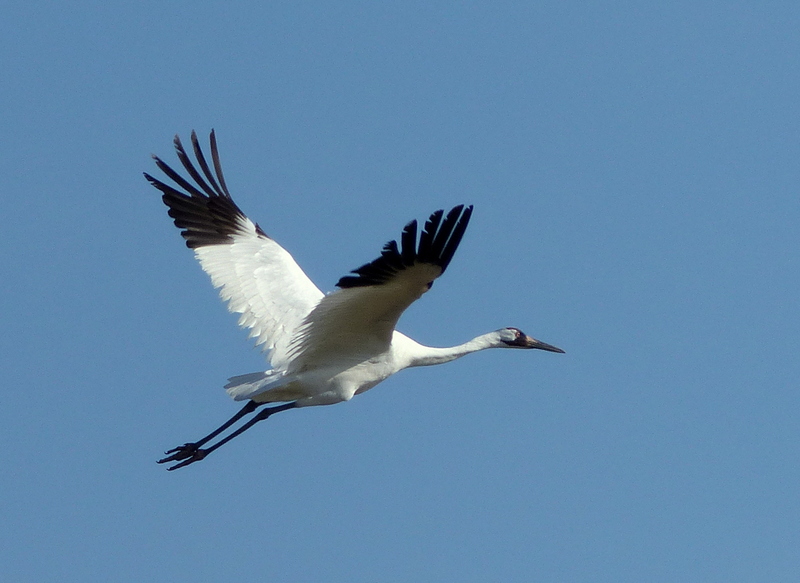 There’s also another group of whooping cranes in Wisconsin. 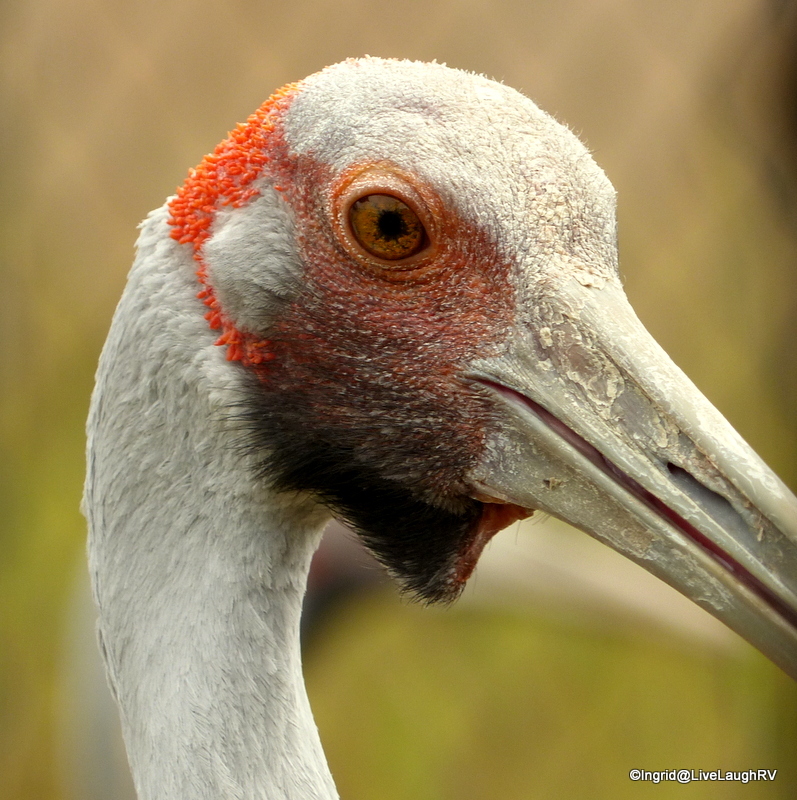 You can read more about this group and the International Crane Foundation here. Even though I’ve said it before, I’ll say it again…. 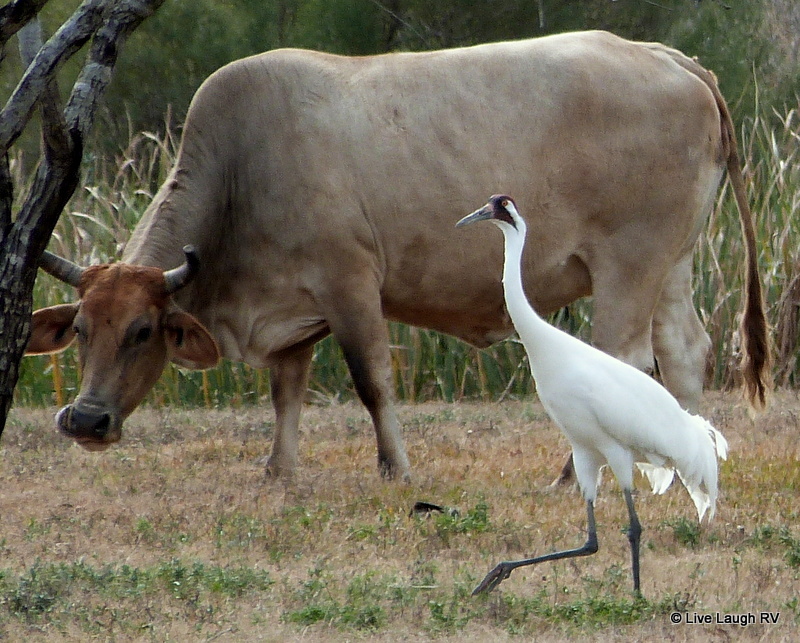 I don’t consider myself a birder, just someone who appreciates the beauty of wildlife. 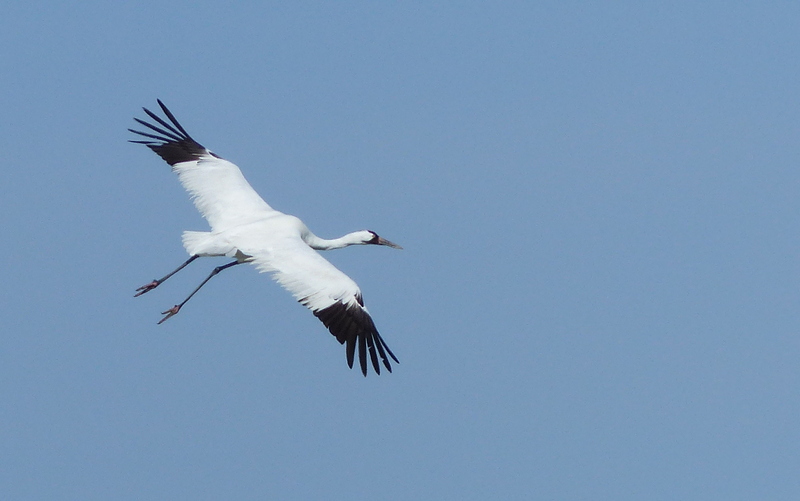 And the whooping crane is one fine and rare beauty that draws me back to this part of Texas time and again. When Al and I were invited to join friends in Rockport, Texas, for the month of January, we weren’t sure what to expect. The arrangement for our month long stay at a RV Park was set up by the friends. 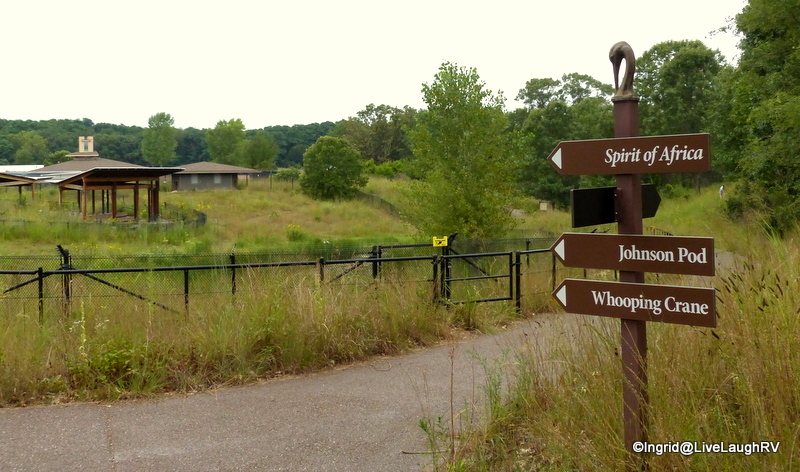 I’ll admit my initial thought upon pulling into this park was less than favorable, but little did I realize I was within a bicycle ride of an endangered bird. Birder I am not, but I am a huge fan of all kinds of wildlife. 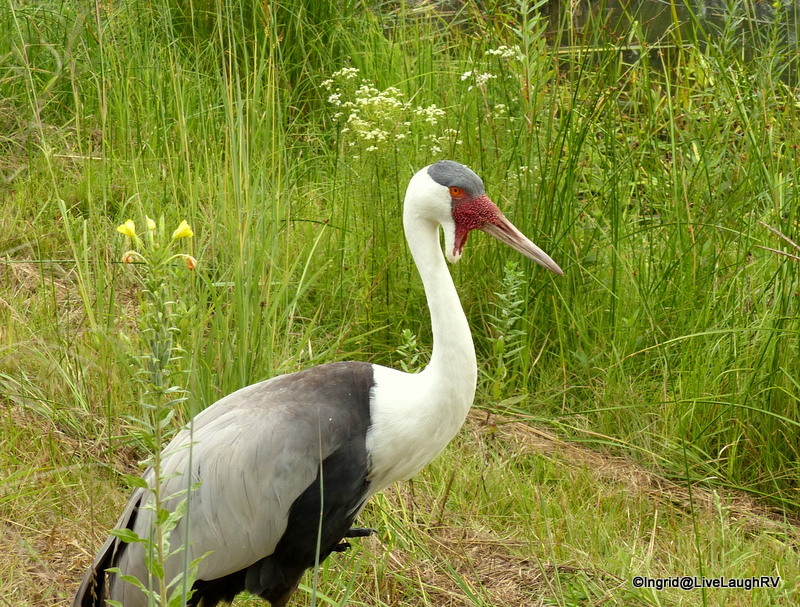 That said, I was surprised that on my morning walks or bike rides I would routinely see a bird that is regarded as a special and rare treat to behold. 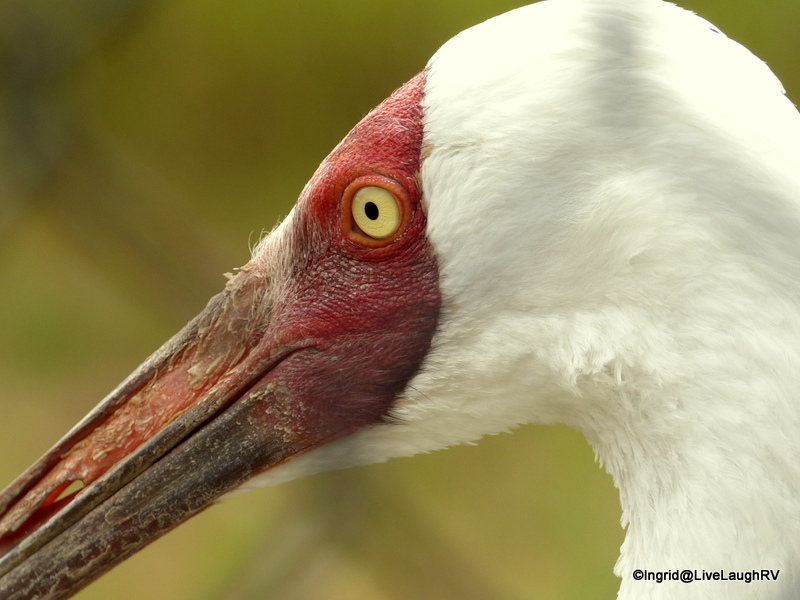 Hailing from Canada, the whooping crane arrives to the Gulf of Mexico around mid-November. 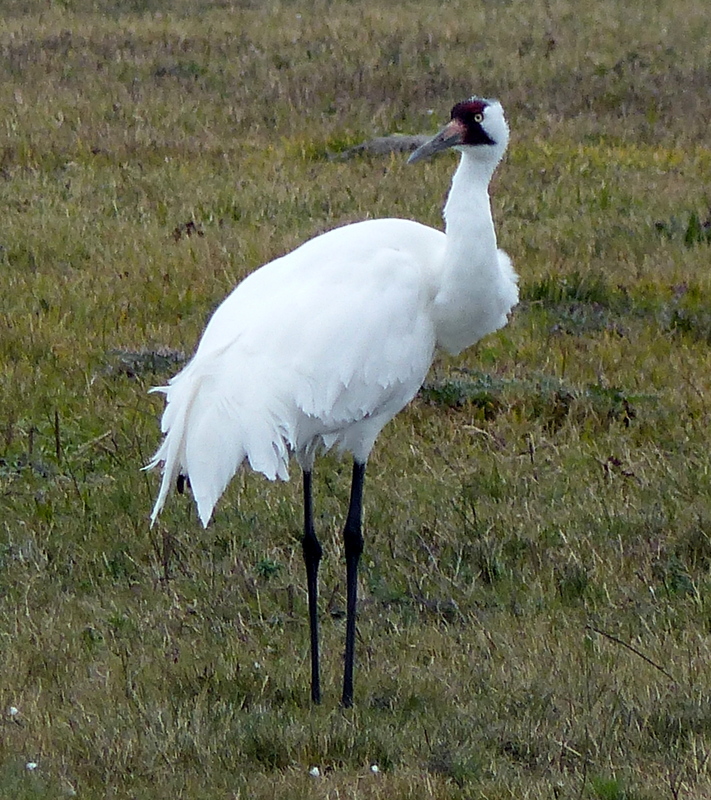 The whooping crane is the tallest of the North American birds standing at 4 to 5 feet tall with a wingspan of 7 ½ feet. 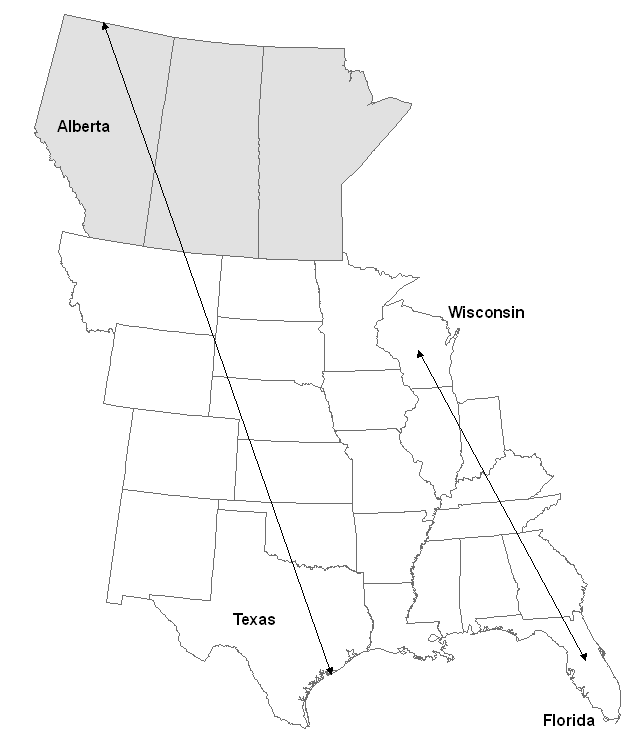 During their migration south, they average 400 miles a day gliding on thermal currents. 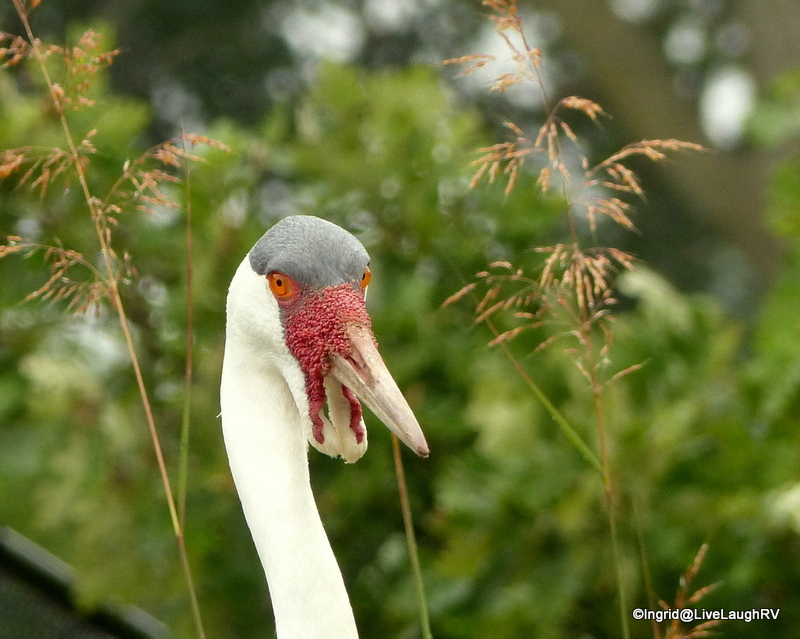 Their plumage is white with patches of red along the top of their heads and streaks of black under their eyes. 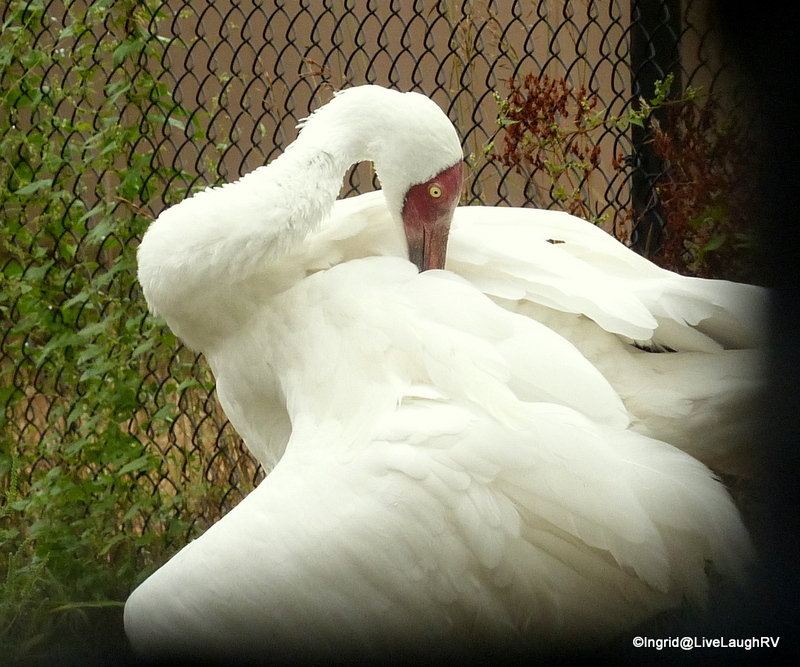 Young whoopers have rust colored markings. 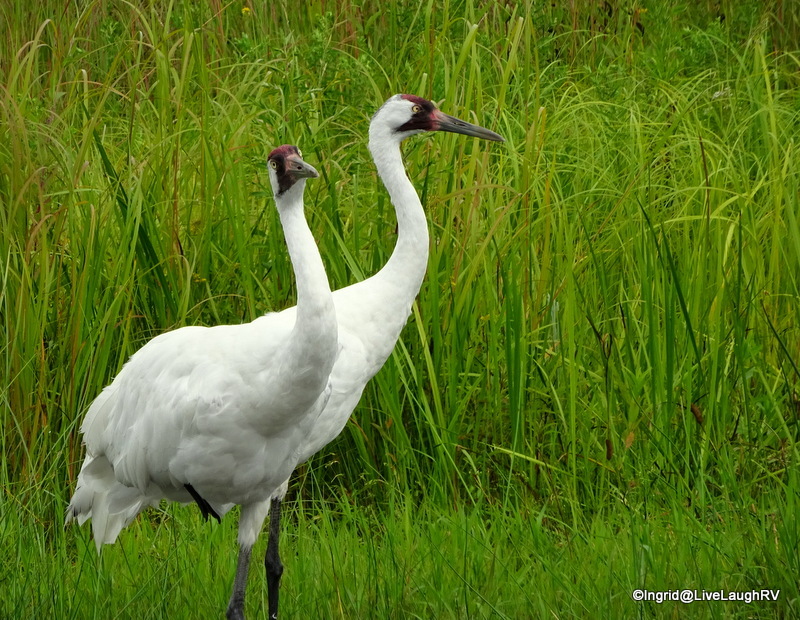 Whooping cranes are one of the best known of all endangered species. It’s believed only 15 or 16 survived the winter of 1941-1942. The present world population is about 475 wild and captive whoopers. 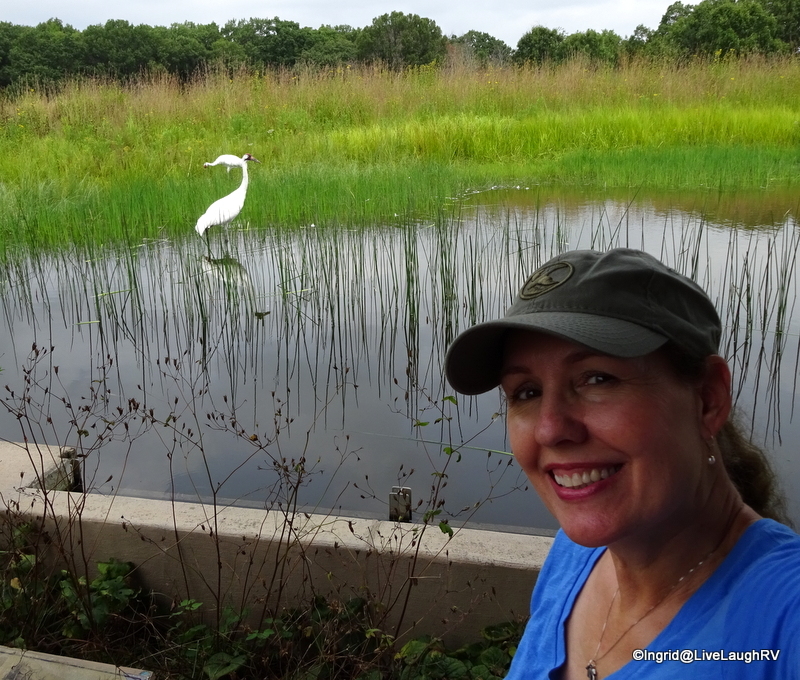 Only one self-sustaining population survives in the wild and they spend their winters in Aransas National Wildlife Refuge. 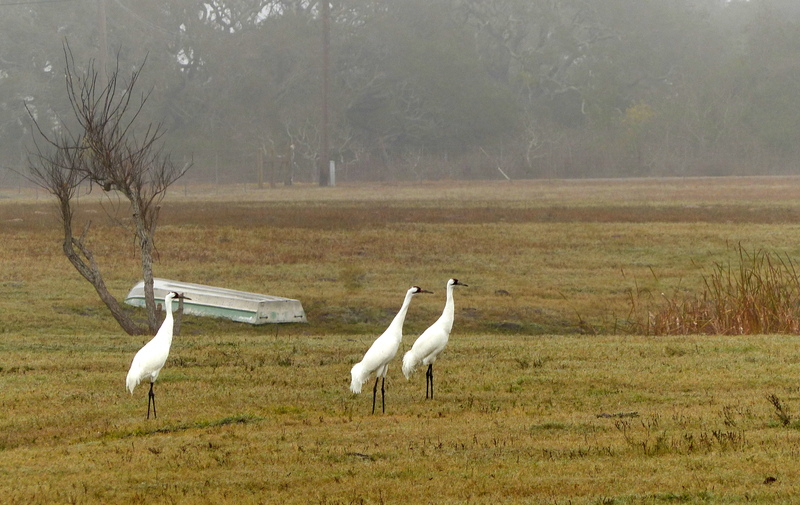 Our RV Park is located on the other side of the St. Charles Bay from this refuge. It appears there are several whoopers who like to visit my side of the bay, just down the road. I know, how cool is that?